Genoa is the capital of the northwestern Italian region of Liguria. It is the chief center of the province of Genoa, and from ancient times to today is an important port in northern Italy. In Genoa now live about 620 000 people and the whole city is located on an area of 243 sq.km. The city is located between the Apennines and the Ligurian Sea, the so-called Genoese Gulf. For the origin of the name Genoa there are two hypotheses. One theory revolves around the fact that the name comes from the Ligurian word "genu", meaning "knee". This can be interpreted as a "corner" because Genoa is geographically located around the corner, which linked the Apennine peninsula to the mainland. The second hypothesis connects Genoa with the Latin word "janua", which means "door" that can be interpreted that the city was the gateway to the sea and the distant horizons. Genoa has a rich history and culture. The city, along with Venice, Pisa and Amalfi, has maintained one of the largest and most powerful fleets in the Mediterranean. The settlement flourished thanks to trade, shipbuilding and banking. In the 18th century Genoa gradually begins to lose political and economic positions from the shift of the main trade routes from the Mediterranean to the New World. 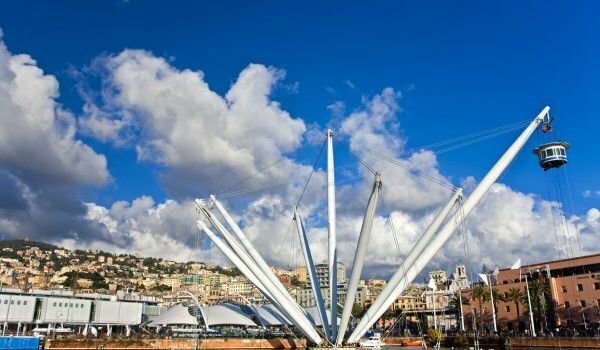 Gradually, Genoa became a tourist and cultural area. One of the main streets of Genoa is the Strada Nuova, where there are many beautiful sights of the Italian town. It is part of the inspiring old city of Genoa, which is included in the list of World Heritage Sites by UNESCO. Here you can see palaces Palazzo Rosso, which is now a museum, Palazzo Bianco, Palazzo Grimaldi and Palazzo Reale, which served as homes of urban elites in the 16th century, when these buildings were erected. In Strada Nuova is the college art museum in Genoa. 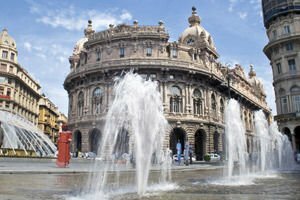 The central part of Genoa can not help but impress you with Piazza De Ferrari, on which stands the opera Teatro Carlo Felice. Today, this cultural landmark of Genoa has continuous opera and ballet performances, recitals and orchestral performances. On the square is located Palazzo Ducale. In the past it was home to the Dukes of Genoa and now it houses a museum and organizes many cultural events and exhibitions. Another magnetic attraction can be seen in Piazza De Ferrari and this is the house where it is assumed that Christopher Columbus was born. Sightseeing in Genoa must include the San Lorenzo cathedral, whose foundations were laid in the 4 or 5th century and was completed in the 17th century. The temple is designed in a magnificent Roman style. Extremely beautiful is the Porto Antico, which was renovated and now is a great place for recreation and tourism. At the entrance of Porto Antico, rises Palazzo San Giorgio, which today serves as headquarters of the Port Authority of Genoa. Do not miss the ancient Torre della Lanterna. It is considered the oldest structure of this type in the world, and on it can be seen the symbol of Genoa. 375 is the number of steps that lead to the top of the lighthouse where you can see all the beauty of Genoa. Undoubtedly the biggest attraction of the port is considered the biggest aquarium in Europe. Built in 1992, the beautiful aquarium cuts directly into the sea. Here you can see diverse marine representatives, such as dolphins, sharks and penguins. Annually about 1.5 million visitors view this aquarium in Genoa. Another must for tourists place in town is the Museum of Oriental Arts, which owns the largest collection related to Oriental art in Europe.